The flank is not the tenderest cut of beef, but it may be the most flavorful. To make it tenderer, I marinate it and slice it against the grain very thin on the bias after cooking it. So what you start with is very thin steak, and what you end up with is large thin slices of char-flavored meat that resembles roast beef. 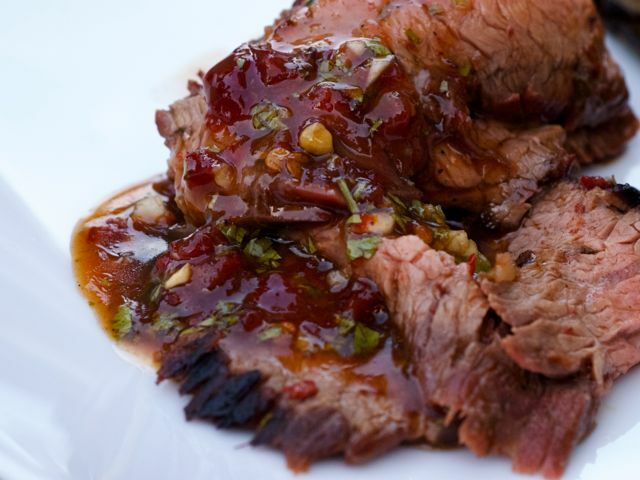 The acid in the lime marinade is very complementary to the char flavor of the meat. Marinate it anywhere from 4 to 6 hours; any longer than that, and the lime juice will actually cook the steak, leaving you with gray meat. Make sure your grill is really hot. Because this thin cut of meat takes very little time to cook, you need that intense heat to give it the color you want. The sauce is a sweet/hot combination that features chipotles, which are dried smoked jalapeño chile peppers with a very distinctive flavor. Adjust the heat to the level you want, using the chipotle as your fuel. Prepare the steak: Place the steak in a large dish or baking pan. Mix all the marinade together, then pour the marinade over the steak. Cover the steak and let it marinate in the refrigerator for 4 to 6 hours, turning occasionally. Make the sauce: Combine the honey, peanut oil, chipotles, vinegar, mustard, lime juice, garlic, and cumin, and purée in a blender or food processor. Stir in the chopped cilantro and add the salt and pepper to taste. Cook the steak: Salt and pepper the steak to taste. Over very high heat, grill the steak for 5 to 7 minutes on each side (for medium rare). Remove the steak from the grill and let it rest for 3 to 5 minutes so the juices that were drawn to the center by cooking redistribute for even color. Then, using a very sharp knife, slice the steak as thin as you can, against the grain and on a very sharp angle. Serve the steak, which should be very juicy, either plain or on top of sliced French bread, and accompany each serving with several tablespoons of the sauce.